I want to put a segment of an image to another image. But to make it realistic I applied poisson blending. But the output is not good at all. Output without poisson blending. 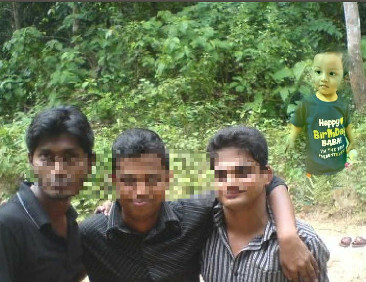 The kid was cropped from another image. I have no clue what else to try. I though of calculating average value of the image segment where the kid is placed and then scaling the kids color to that average. But it should not work properly if that image segment is very white or black etc. Move the child down slightly so the right foot is behind the shoulder. Reduce their size almost 50%. Blend only the outline of the child with the background, at most a few pixels. 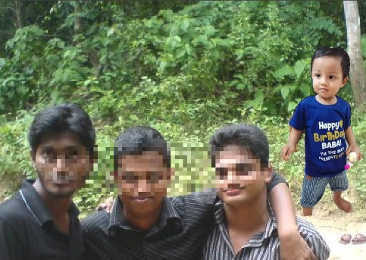 The men appear to be standing straight while the child appears to be leaned forward slightly - rotate the top of the inserted image backwards ~5°. Reduce the brightness of the child slightly. Doing the above should result in a realistic result. Not the answer you're looking for? Browse other questions tagged image-processing color blending or ask your own question.